On Friday 15th March, ourselves and around 40 other individuals from Year 11 were given the opportunity to participate in a ‘Geography Revision Weekend’, taking place at Grinton Lodge, situated in Swaledale, North Yorkshire. The location itself had an incredible, picturesque view; a great atmosphere to revise in. Although the weather was a slight inconvenience, nevertheless we were able to productively work through revision booklets and gain a greater understanding of our course. For instance, most of us find map work to be fairly challenging, therefore the frequent practice with maps has most definitely provided us with more knowledge and techniques for exams. The quick-fire questions which took place on Friday evening through a game of pass-the-parcel were definitely beneficial and fun, and it proved that there are so many different ways to revise. 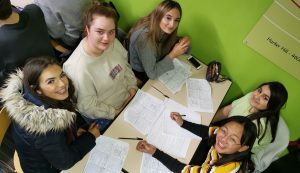 Fortunately, we found that the teachers were incredibly helpful during revision and we found the experience hugely enriching; it has certainly boosted our confidence for the upcoming exams taking place in June. The consistent practice of questions and clever tips from geography teachers will most definitely prove to be beneficial during the exam season. We’d most definitely recommend this trip for future GCSE students since it has certainly boosted our confidence for the upcoming exams.